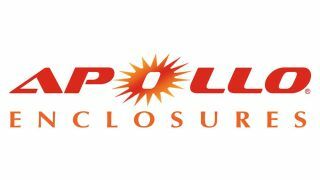 The What: Apollo Enclosures is expanding its commercial market offering with the introduction of all-weather outdoor digital signage PRO Line. The commercial-grade enclosures are designed to house and protect ultra-bright displays in outdoor applications. The What Else: The Pro Line is comprised of Models DS5550, a 55-inch enclosure that houses 50- to 55-inch displays, and Model DS6560, a 65-inch enclosure that houses 60- to 65-inch displays. Both models are available in portrait and landscape orientations. The enclosures retail at $1,995 and $2,195 MSRP, respectively. The E-Z mount interior TV brackets simplify installation and provide easy access to peripheral equipment, convenient cable management, and display replacement or repairs. The enclosure provides three internal outlets; one for the fans, one for the display, and one auxiliary for media players, baluns, or other electronic components. The enclosure also includes an 8-inch by 9-inch expanded media compartment cover to house media players up to 2.75 inches deep. Available accessories include a thermostatically controlled heater module for areas of high humidity or where temperatures dip below 0 degrees F; modesty frames for framing smaller size TVs in the enclosures; and three designer colors upgrades (silver, metallic sandstone, and white). A selection of all-weather mounts with stainless steel hardware is also available.